MnDOT has long been a leader in the use of recycled asphalt pavement or RAP. Much of the nation’s current use of RAP in hot mix paving asphalt is based on the methods first used in a 1978 project that reconstructed the streets in what is now the 3M campus in Maplewood. Subsequent MnDOT projects using as much as 80 percent RAP in hot mix paving revealed significant pavement performance problems, according to Curt Turgeon, state pavement engineer. Currently, MnDOT asphalt paving specifications allow 30 percent RAP in overlay projects and 20 percent RAP when crack resistance asphalt cements are used in new or reclaimed pavements. For economic and environmental reasons, Turgeon said MnDOT has renewed interest in increasing the use of RAP. Work includes trials of varying percentages in hot mix, trials at MnROAD of cold central plant recycling, and continued use of cold in-place recycling and full depth reclamation. In District 6, a 13-mile section of the 30-mile Hwy 52 resurfacing project contains 40 percent RAP on the wide outside shoulders. The mixture contains proprietary additives to potentially assist in the rejuvenation of the RAP. Tom Meath, District 6 materials engineer, said the higher percentage is being used because of the abundance of RAP available. 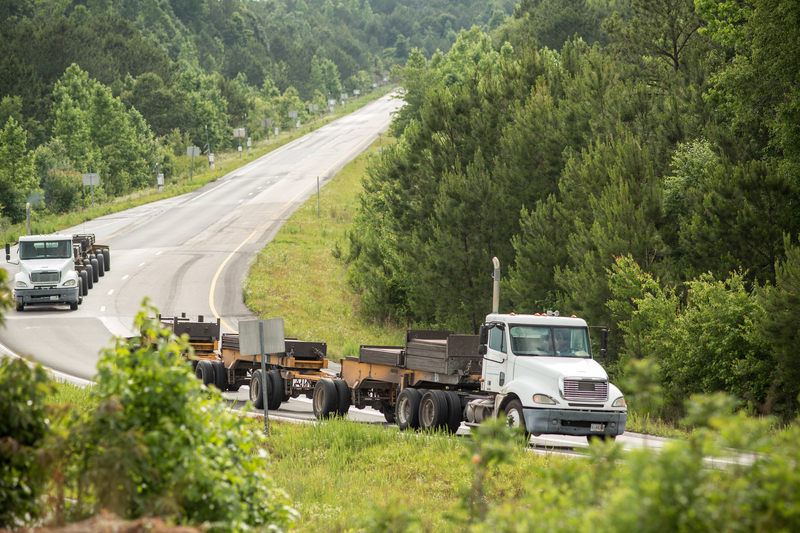 “This project allows the contractor to use up stockpiles of pavement from this and other projects and reduces the amount of new material needed, while not diminishing the quality of what’s used in the traveling lanes,” he said. Meath said there are counties and cities in District 6 already using 40 percent RAP, but this is the first time MnDOT is trying it. This year’s MnROAD reconstruction, funded by the National Road Research Alliance, contains test sections of cold central plant recycling. This process uses 100 percent RAP mixed in a standard plant at ambient temperatures using an emulsified or foamed asphalt cement. The result is a product that is not resilient enough be used as a top surfacing so the test sections will receive either a standard hot mix overlay or a double chip seal. The resurfacing portion of the Hwy 110 project east of I-35E and I-494 in Mendota Heights and Inver Grove Heights will use 100 percent recycled asphalt as the base layer of pavement. Tim Clyne, Metro pavement and materials engineer, said using 100 percent saves on rock and asphalt costs, trucking costs and time. Since the material is reused with the cold in-place recycling process, the result is a more variable product than the material produced at the plant. Hot mix will be used as the top surface. See a video of cold in-place recycling, which shows a milling machine, a machine that screens and crushes oversize materials and then mixes in an asphalt emulsion, an asphalt tank and an asphalt paver and roller. Full depth reclamation uses equipment often described as a rototiller for pavements. The asphalt pavement and some of the existing base is ground together in place. Multiple passes of the reclaimer are often used. The final pass may include the addition of a binder such as asphalt emulsion, foamed asphalt, cement or lime. The result is an aggregate base with the old crack pattern completely erased. “Hot mix overlays on full depth reclamation base have shown excellent performance compared to a typical mill and overlay project,” said Turgeon. Economic and performance benefits of these techniques are well understood. Until recently, the environmental benefits of using materials in place instead of hauling off to a plant haven’t been well documented. MnDOT participates in the Recycled Materials Resource Center pooled fund project now housed at the University of Wisconsin – Madison. In June 2017, the RMRC completed an analysis of nine paving projects that documented an average of 22 percent overall savings and 20 percent savings in water usage. This post was written by Sue Roe and was originally published on MnDOT’s Newsline on Aug. 23, 2017. Walking along a half-mile segment of Co. Rd. 8 near Milaca last month, materials engineers from around the country got a first look at a shared test site for pavement preservation. Nearly 60 one-tenth mile sections of Co. Rd. 8 and nearby Hwy 169 were recently treated with various combinations of fog seals, chip seals, crack seals, scrub seals and microsurfacing and a number of thin overlays. Data will be collected from these experimental test roads for three years and compared with the results of a similar experiment in Alabama, where the same test sections were also built on a low- and high-volume roadway, to see which techniques are the most effective for preserving road life. “Evaluating pavement performance in both northern and southern climates will provide cost-effective solutions that can be implemented nationwide,” said Ben Worel, MnROAD operations engineer. Nineteen states, which are co-funding the study through MnDOT’s road research facility (MnROAD), were in town Oct. 26-27 for a joint meeting with the National Center for Asphalt Technology in Auburn, Ala. In addition to touring test sections built this summer near Milaca and at MnROAD’s permanent test track in Albertville, the group reviewed preliminary research results and discussed ideas for new experiments. MnROAD began two joint research efforts with NCAT last year to advance pavement engineering issues that affect both warm and cold climates. In addition to determining the life-extending benefits of different pavement preservation techniques, the partnership has also built test cells to evaluate which asphalt cracking prediction tests best predict future pavement performance. This second study will help state DOTs improve the quality of asphalt mixes, so roads hold up better through harsh winters, leading to less thermal cracking and fewer potholes. Click here to learn more about the MnROAD-NCAT partnership. The nation’s two largest pavement testing centers are planning to partner in order to better leverage research performed at their cold and hot-weather facilities. 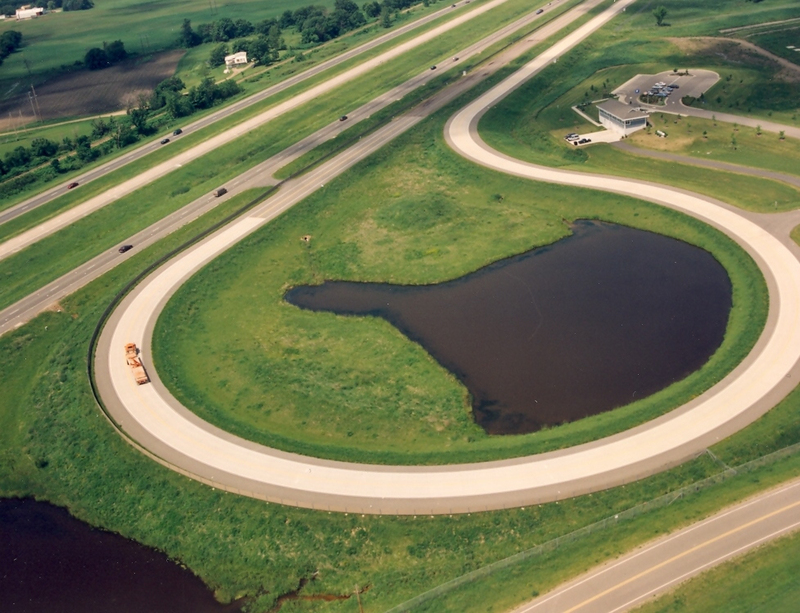 MnROAD, located in Albertville, Minnesota, and its southern U.S. equivalent, the National Center for Asphalt Technology in Auburn, Alabama, are full-scale test tracks that evaluate different types of pavement material under real-life conditions using semi-trailer truck and live interstate traffic. Each facility has a history of evaluating the performance of pavement preservation treatments, including chip sealing, micro-surfacing, crack sealing and thin overlays. To address needs in both northern and southern climates, similar test sections would be developed at each facility to address national issues. A test track at the National Center for Asphalt Technology in Alabama, MnROAD’s hot-weather equivalent. The partnership idea was introduced to federal officials earlier this month at a national pavement performance conference in Minneapolis. Final details must still be worked out. One of the workshops at the event discussed the proposed partnership between MnROAD and NCAT. Further talks are expected at the end of October. Pavement engineers from around the nation gathered Sept. 2 to 5 for the Midwestern Pavement Preservation Partnership forum and the SHRP2 R26 Workshop for the Preservation of High-Traffic-Volume Roadways, which featured tours of MnROAD, Minnesota’s cold weather pavement testing facility. Conference participants also reviewed the latest preservation techniques being developed for high volume roads. MnROAD’s chip sealing study, which demonstrated that highways with an average daily traffic (ADT) of 58,000 can be successfully chip sealed, was especially attention-grabbing for agencies who don’t chip seal on roads with more than 2,000 ADT. A national panel of speakers included Michael Trentacoste, director of the federal Turner-Fairbank Highway Research Center (pictured in top photo), who discussed Federal Highway Administration’s support of pavement preservation research and implementation. 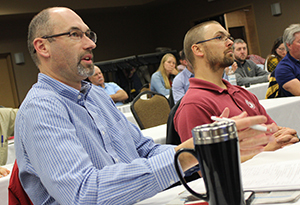 With about 160 people in attendance over four days, MnDOT Materials Engineer Jerry Geib said the conference was successful in sharing the benefits of pavement preservation techniques with other state DOTs and federal highway officials who want adopt new practices to help alleviate budget constraints. The only way to test pavements is to destroy them — slowly and painstakingly, one moving vehicle at a time. At MnROAD, the state’s world-renowned pavement research facility, the bulk of this monotonous-but-necessary work is performed by live traffic passing through Albertville on I-94. But on the facility’s 2.5-mile low volume road test track, which simulates rural road conditions, more controlled methods are preferred. Doug Lindenfelser is one of several MnROAD employees who take turns driving an 80,000-pound semi tractor trailer in laps around the closed-loop low-volume track. The truck is loaded to the maximum allowable weight limit on Minnesota roadways. As it passes over the facility’s 23 distinct low-volume test cells, an array of sensors capture data on the pavement’s performance, which researchers then use to design stronger, longer-lasting roads. The truck only drives on the inside lane; that way, the outside lane can be used as an “environmental lane” to compare damage caused by loading vs. damage caused by environmental factors. He has other duties as well, but on a given day, Doug might drive the truck 60 or 70 times around the low-volume road test track. It might not sound very exciting, but as Doug explains, some days his job can be quite interesting. We interviewed him on camera during a recent visit to MnROAD. The resulting video is available above and on our YouTube channel. For those who might be wondering, all this diligent destruction of pavement has paid off. It is estimated that MnROAD’s first phase of research (from 1994-2006) has resulted in cost savings of $33 million each year in Minnesota and $749 million nationally. Cost savings from its second phase (2007-2015) are being calculated, and the facility is scheduled to enter its third phase in 2016.